The romance of railroading has captured the imagination of anyone whoever dreamed of faraway places or the power of commerce opening new frontiers. On Christmas Day in 1830, the same year in which the American built steam locomotive "Tom Thumb" broke down and lost a race to a horse, the first steam passenger service was successfully inaugurated by the South Carolina (later the Southern) Railway out of Charleston, pulled by an "Iron Horse" named "Best Friend." Within five years, a thousand miles of track were laid in eleven states, and by the outbreak of the American Civil War, over 30,000 miles of rail lines were in operation in the United States. 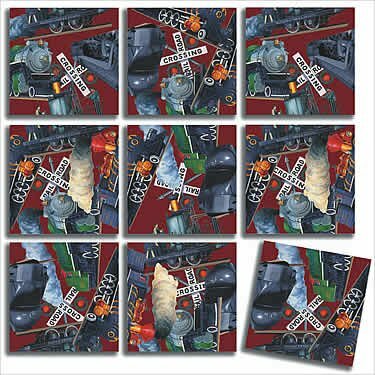 There are four classic locomotives pictured on this Scramble Squares® puzzle. Phineas Davis completed his "Grasshopper" locomotive, named the "Atlantic" for the B&O Railroad in September 1832, and in June 1833, President Andrew Jackson boarded a B&O passenger coach at Relay, Maryland and traveled to Mt. Clare Depot, becoming the first U.S. President to ride a railroad. The Whyte System classifies steam locomotives by the arrangement of their wheels, first by the number of lead or "pony" wheels, then by the number of the large driving wheels, followed by the number of trailing wheels. In 1879, the 2-8-0 was the world’s largest steam locomotive, weighing 115,000 lbs., carrying its water supply in a saddle tank and its coal bin was attached to its cab. Its eight 50 inch driving wheels alone weighed 96,000 pounds! It became the standard mainline freight power on the Atchison, Topeka & Santa Fe Railway by 1880. The Southern Railway System’s mainline freight power was the Baldwin 2-8-2, built in Baldwin’s Richmond, Virginia and Eddystone, Pennsylvania plants between 1923 and 1928. These work horses were assigned to fast freight and passenger service until their retirement in 1953. The pinnacle of steam locomotive design was the Norfolk & Western Class J 4-8-4, designed and built in the 1950s in the railroad’s Roanoke shops. It had a massive 300 psi boiler hidden beneath its streamlined exterior. By the late 1950s, the new, more efficient diesel-electric locomotives replaced these behemoths of the rails and the other steam locomotives.